The last few days I’ve been passing on the book collection my late Father in Law had built up over 50 years. There were in excess of 1500 books and it’s been really tough. At one level there is the basic problem of handing over a book. There is something about a book that seems to create a physical and rational attachment that makes it hard to let got. For me a book is a physical artefact that stands for hard work, knowledge, wisdom and learning. Why would anyone what to part with it? I bet many people still have childhood or college books that they hold onto ‘just in case’, I know I do. At an emotional level it was even worse. Almost every book seemed to have slips of paper or cards inserted into them where my Father in Law had written notes and comments. These weren’t just books to decorate the shelves, he’d read them all, some of them many times. His personality was literally written across the collection. Could anything make this a less of a difficult experience? When it came to topics where I have limited interest and very little understanding, things were slightly easier. Saying goodbye to an ancient tome, in Latin or Greek became easier after a while. I had to keep reminding myself that if I didn’t take positive action, these books would end up sitting in boxes in my house. This was a good practical, no-nonsense motivator. However, the biggest help was finding someone who loved books and was prepared to take care of them. I was fortunate to find Andrew Mitchell the owner of Capital Bookshop in Morgan Arcade, Cardiff. As it turned out my Father in Law had been a customer of Andrew’s for many years. My Father in Law had sold books to Andrew and bought many others from him. It felt like this was an opportunity for some of these books to ‘go home’ and find their way onwards, back into the hands of new people who would love, cherish and above all learn from them. I think my Father in Law would have liked that. If you are in Cardiff, please pop in to Capital Bookshop to see Andrew. Hopefully you’ll pick up a book my late Father in Law used to own. It will have A Whiley written inside the cover. Handing them over so that someone else can enjoy the books and learn from them was a good thought. Thank you very much for a really heartfelt blogpost for a Monday morning. I always really enjoy your writing and observations, but this post inparticular struck a chord. Thank you for sharing this experience with us. 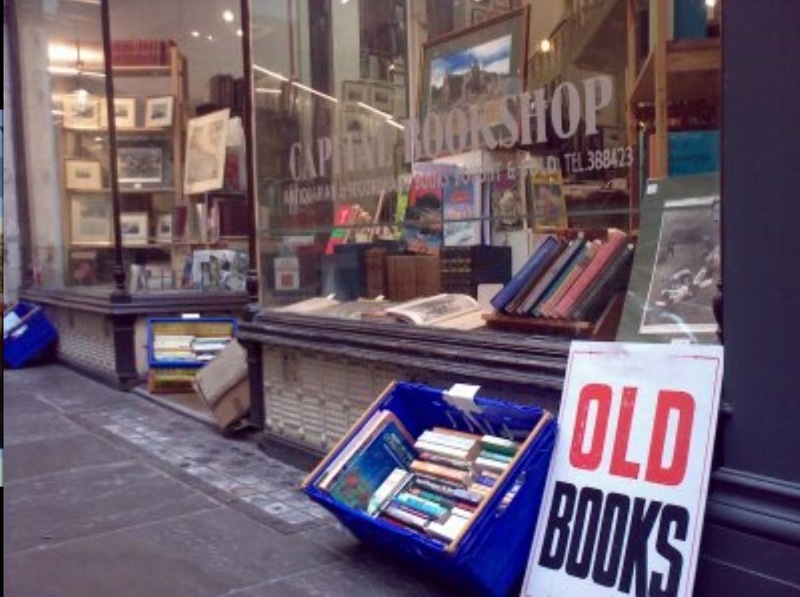 I will visit Capital Bookshop next time I am in town. Please do go and visit Andrew at Capital Bookshop. Having independent book dealers like Andrew keeps these books alive for future generations to use them. It was that thought that made it easier to pass them on. I love this post and it reminds me that – for all we gain – we also lose something from digitisation. I have books – magazines too – I just can’t give away as they remind me of certain place , time or person. Well made point about how this fits with the digital world. Interestingly my Father in Law had masses of digital material also. A CD doesn’t quite have the same attachment as a dusty old book. I’m thinking about a post about the difference between 1920’s publications on the First World War and multimedia CDs as he had the full range in his collection, mostly old books though. I must I’m still struggling to find someone to cherish a huge collection of Russian books. A bit of a specialist topic. Don’t suppose you know anyone? I’ve kept hold of quite a few things, but there was such a lot. They my pop up in blog posts from time to time. I am glad you have found the right place for them. Going through a similar thing right now, having to sift through my late mothers posessions. She had actually disposed of many of her books, by gifting them to friends but I still have a few. Mom always tucked a slip of paper in with the characters names in, sometimes a family tree, or other notes about the plot. Heartwrenching to decide what to keep. The ones I have passed on are to people she knew who will care for them and read them. She also collected clothes, expensive beautiful clothes and asked me to make sure they went to people who would love them and told me I must sell them (as she had herself done so). 40 bags to charity shops, and now selling the designer labels incuding 4 Burberry macs,and donating a substantial amount of the proceeds to niche community groups or charities who do not get funding. It has been tough as I too know I cannot keep everything, as I am planning on downsizing and currently donating and selling a huge amount of my own books. Now what to do about the photographs? ← Six Oi Conference Learning Points – all in a 6min podcast!